For the control of gastrointestinal tapeworms and roundworms in dogs and puppies. Echinococcus species, Taenia species, Dipylidium caninum (adults and immature forms). 1 Drontal Plus XL Tablet per 35 kg (77 lbs) bodyweight. For oral administration, the tablets can be given directly to the dog or disguised in food. No starvation is needed before or after treatment. 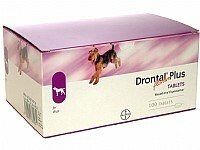 Drontal Puppy Suspension may prove a more convenient product in puppies and young dogs up to one year of age where treatment is required for roundworms only.